It was a Saturday evening at Valette restaurant in Healdsburg, California. There were smells of fresh garlic roasting on the grill and hot bread baking in the oven. There were tables filled with smiling friends, new and old. There was a great array of wines from local producers atop tables made of fallen trees from restaurant owner Dustin Valette’s family retreat. The Setting couldn’t have been more perfect. It was then that we realized how much better the wine tasted because of the perfect Setting. And it was then we named our new venture, The Setting Wines. We have learned that great wine consists of a lot more than just grapes. It is the handiwork of artisans and requires skilled farming, excellent timing and dozens of other factors being just right. 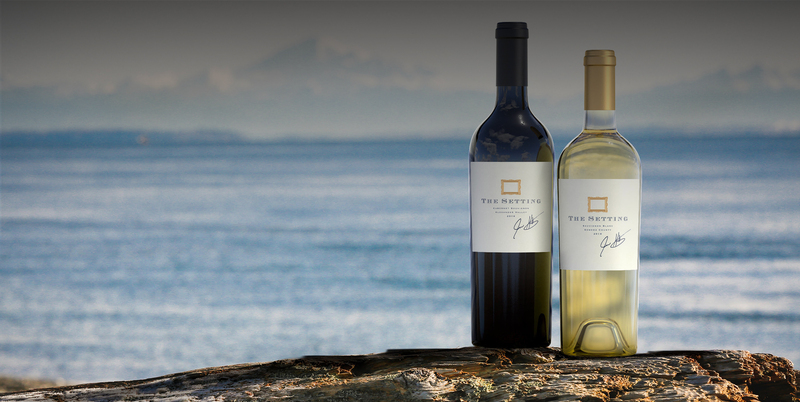 We have learned that as great as wine may taste, the setting in which we enjoy it is equally as important. The people you are with, the time of the day, your surroundings and so many other factors are key parts of the setting… and therefore The Setting Wines celebrate all of those important factors. Partner and winemaker Jesse Katz has a unique ability to create wine that is the perfect balance between what the fruit wants to be and what the most discriminating palettes want to enjoy. He has the unrivaled ability to source the finest fruit from the best vineyards and couples that with a knack for timing, incredible selection of barrels, and unmatched blending magic. These are all reasons we believe our product is as good as it gets. Three friends and our families have been privileged to become closer because of the power of wine and the settings in which we have enjoyed it. The inspiration for The Setting has come from family dinner tables, European vacations, memorable experiences in Sonoma vineyards and Napa estates, fine restaurants and spending time with those we love most. We invite you to be a part of our Setting Family.